Thanks to an RV sales company kindly letting us fill our fresh water tank as we passed by yesterday we were able to have a lovely hot shower to start the day. 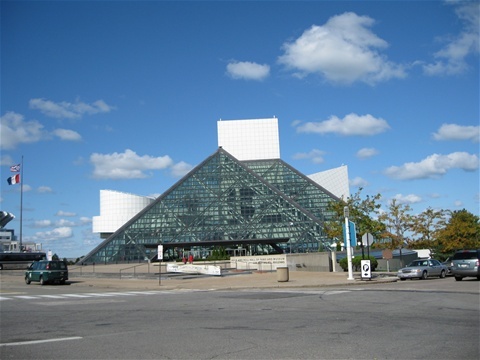 This morning after much debating we elected to catch a bus down to the Rock & Roll Hall of Fame, 1100 Rock and Roll Blvd, Cleveland, Ohio 44114 www.rockhall.com as I really didn’t want to go back in to town with the RV. It not only increases stress levels but also the risk of sustaining vehicle body damage, and serious body damage would cause us to not only lose our mode of transport but also our accommodation. The bus journey to downtown Cleveland www.travelcleveland.com took 45 minutes and cost us $8 for two All-Day passes on the bus network, with the added bonus that we didn’t have to worry about parking the RV somewhere once we’d arrived. My first port of call was at the AT&T building which we’d spotted on the way to the museum. After relating the story they credited the money they owed us on the mobile phone account from the last trip. The Rock & Roll Hall of Fame was in a very nice setting on the edge of Lake Erie, the entrance fee of $22 seemed a lot of money, but I supposed it kept us entertained for a few hours. The lower floor is the main one for exhibits too numerous to mention but consisted mainly of costumes and instruments of leading artists. Rosina seemed particularly pleased to have seen Michael Jackson’s red jacket from the ‘Thriller’ video on display. For me nothing really stood out but it was a generally interesting experience and I was pleased to see UK artists so well represented. Again sadly, no photography was permitted beyond the foyer. We left the building to a lovely warm, sunny afternoon and so had a stroll along the edge of the harbour for a little way before heading in to what was presumably the Business District. There was a lot of interesting architecture and none of it too far from the shore of the lake, all in all a nice area. We had hoped to go up to the observation deck at the Terminal Tower which apparently offers really good views across the city and lake, but unfortunately it was closed due to refurbishment work. We tried our luck at playing sad and disappointed tourists with the security staff at another skyscraper but they couldn’t or wouldn’t let us in, and up. The Chef wasn’t feeling too hungry and so I picked up a ‘to go’ Chinese meal from a fast food chain for our evening meal and carried it back on the bus. Unfortunately not even another walk around the harbour area had cooled it down enough to prevent the smell from wafting through the bus. The other passengers had to endure it longer than we’d have liked as the bus driver decided to be helpful and take us to a better Wal-Mart much further out of town before we managed to convince him that we didn’t want to go shopping, we wanted to find our vehicle which we’d left in the car park. We therefore had to jump off the bus and go back in the opposite direction a few miles, but at least by the time we arrived home the food had cooled. A nice, quick, hot meal blasted in the microwave, whilst sat in Wal-Mart’s car park was a fitting end to a busy day. Tomorrow we will leave Cleveland first thing and make our way along the shore of Lake Erie heading northeast towards Niagara Falls. We have booked in to a reputedly very good campground enroute tomorrow night to compensate for all the freebie’s we’ve been doing recently, much of it out of necessity due to the lack of campgrounds.